A glass fountain is a beautiful feature to look at, but it can also serve a purpose. Many people do not realize that it can be more than just a pretty breakable thing you put in your home or office. It is actually something much more. For most people, if they see the many uses of a fountain, they will desire one of their own. But as long as they think of it as a simple thing, they will not want to own one. The following uses of a glass fountain will help you decide if it is right for you. There are many things to be said for having a glass water fountain as a decorative piece. 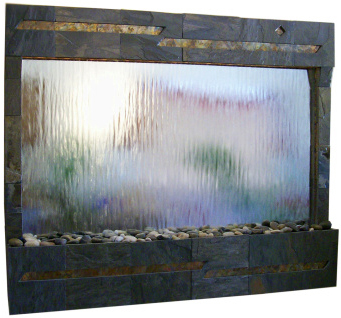 A glass wall fountain will add majesty and class to your décor. You can also place fountains on the floor or on a small table. It all depends on what type of fountain you want for your home or office. Decoration pieces make great centerpieces as well. For a special occasion like a wedding or engagement party, you can use small glass waterfalls as centerpieces for the guest tables or the main table. It adds a certain elegant touch to the party décor. And, the smaller ones are not horribly expensive. Later, you can take the centerpiece home and place it on a small table as a lasting reminder of your special day. Another twist on this centerpiece idea is to fill the fountains with champagne instead of water. There are many practical uses for a glass fountain as well. For example, many people like to use fountains for meditation purposes. The sound of the water gently falling in the fountain is excellent background noise for meditations. Focusing on the sound of the water can lead you into a meditative trance. In addition, watching the water flow through the fountain and against the glass can be meditative and relaxing in nature. There are many ways you could incorporate this into your meditation or relaxation techniques. In the end, the fountain would have assisted you in feeling refreshed and ready to face the world. Another practical use for certain types of glass water fountains lends itself to a healthy alternative to a standard humidifier. There are special fountains that have diffusers built into them. This turns a simple fountain into a humidifier. It is much more beautiful and aesthetically pleasing to the eye than one of those big plastic monstrosities. It is also just as effective, and can be a part of your décor as well as a useful item. Many people prefer these hard to find fountains for their homes. Regardless of the purpose you have in mind for your glass fountain, you will want to make sure that you choose one that fits your purposes. Consider all the uses for a fountain before you make a purchase decision. There are many types of them out there, and you should not choose hastily. If you take your time in shopping around and making a decision, you will be certain to enjoy your fountain for years to come.